Given the fine attention to detail during harvest, it comes as no surprise that the cold pressing process adopted at Adon & Myrrh uses top-notch Italian machinery (Alfa Laval) and superior methods. We separate olives from their leaves and twigs using a vacuum. 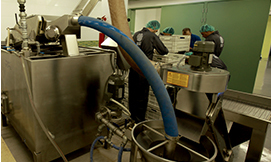 Olives are then washed thoroughly in a rotating drum. Here cutting-edge technology meets age-old tradition and science meets art. 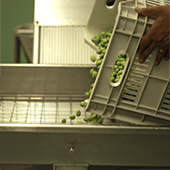 Adon’s remarkable smoothness and mildness is the result of pitting olives before sending them to be crushed. This improves the overall quality and results in olive oil with a gentler texture and a longer shelf life. Myrrh is intense and has richer depth. 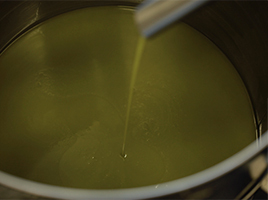 To make it, we use the traditional method of olive oil extraction without removing the pits. The result is a characteristic sharper taste. 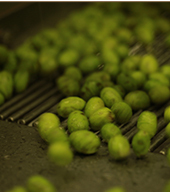 During the crushing stage, olive pulps are crushed completely in a toothed disc crusher. This prevents the olive paste from overheating and eliminates the risk of oxidation. Both our smoother and more intense varieties of olive oil are packed with antioxidants and micro-ingredients thanks to the malaxing stage. This takes place in massive, airtight holding tanks called malaxers. There, the olive paste is continuously stirred at carefully controlled temperatures to provide oil. These tanks are equipped with special high performance double jackets that let us control the temperature with considerable accuracy. Our two-phase decanting stage transforms the oil released by the olive paste into a superior delight. In phase one, horizontal centrifugal forces in the decanter separates the paste into pomace and olive oil. In phase two, the crude oil obtained is cleaned by vertical centrifugation, using a separator. The olive oil is collected into yet another stainless steel tank and is pumped into a closed-drum disk stack centrifuge for further cleaning. It’s clear why Adon & Myrrh is no ordinary run-of-the-mill olive oil. Each drop was carefully made for true olive oil connoisseurs.